“Jammin’ with Jamie” Theme: “Halloween Harmonies in April”! I’m sure you’ve all heard of the phenomenon of “Christmas in July.” At its core, it’s a way of bringing the joy of the holiday season two seasons ahead of time. So, why not do the same for other holidays? This entry was posted in 89.3 WNUR FM, Arthur, Creature from the Black Lagoon, Disney, Elvira Mistress of the Dark, Halloween, Horror Hosts, Jammin' with Jamie, Movies/Film, Music, Northwestern University, Radio, Svengoolie, Television/TV, The Rocky Horror Picture Show, Tim Burton and tagged Halloween Harmonies in April, Halloween in April on April 26, 2016 by Jamie Lee. Valentine’s Day may be over, but we’re still celebrating on Jammin’ with Jamie in our own unique way! Our last jam session was met with some great reactions, proving once more that no matter what your feelings are about Valentine’s Day, hilarious music unites us all! It’s love at first listen! This entry was posted in 89.3 WNUR FM, Crazy Ex-Girlfriend, Disney, Elvira Mistress of the Dark, Galavant, Horror Hosts, Idina Menzel, Jammin' with Jamie, Movies/Film, Music, Northwestern University, Rachel Bloom, Svengoolie, Television/TV, The Muppets, Theatre and tagged Annie Get Your Gun, Bewitched, Sidesplitting Love Songs, Sidesplitting Serenades, Unconventional (& Hilarious) Love Songs, Valentine's Day on February 18, 2016 by Jamie Lee. “Jammin’ with Jamie” Theme: “Jamie’s Favorite Jams (Part 2)”! Our final Jammin’ with Jamie jam session is this Saturday, June 13, from 6:00 to 9:00 am! From the instant I found out I was going to be on the air for the first time in October 2011––– before the show was even called Jammin’ with Jamie––– I knew the show would have an end date. I had to re-apply for my slot three times a year, so for a while, there was also the possibility that someone else would get the slot. But at this point, I’m moving on to a new chapter in my life. I’m filled with that trademark mix of excitement and worry that comes every time you embark on a new start––– something I always encourage you Jammers to do on my show, making sure I always give you the proper motivational melodies to get stuck in your head and give you that extra push when you need it. I want to assure all of you: the last time I sign off of Jammin’ with Jamie isn’t the last you’ll hear from me. In fact, it’s just the beginning. Make sure you keep checking this website, my Twitter, and my YouTube account, and we can keep up with each other’s adventures together! So with that, I give you our final Jammin’ with Jamie jam session theme. Are you ready? This entry was posted in 89.3 WNUR FM, Arthur, Disney, Elvira Mistress of the Dark, Frozen, Galavant, Horror Hosts, Idina Menzel, If/Then, Jammin' with Jamie, Mary Poppins, Movies/Film, Music, Northwestern University, Pee-wee Herman, Pixar, Radio, Riders in the Sky, Svengoolie, Television/TV, The Muppets, Theatre, Wicked and tagged Jamie’s Favorite Jams on June 11, 2015 by Jamie Lee. “Jammin’ with Jamie” Theme: “Travel Tunes”! Jammin’ with Jamie will be two hours this week! We’ll be jammin’ from 6:00 to 8:00 am! In case you missed my announcement last week, after four amazing years, Jammin’ with Jamie is, unfortunately, coming to an end. Including this week, we have three precious jam sessions left together. Our final Jammin’ with Jamie jam session will be Saturday, June 13. For students and everyone else involved in education, the school year is coming to an end, if it hasn’t already. It’s the time when everyone scatters to go home, go on vacation, move someplace new, or even just explore a different part of town. This entry was posted in 89.3 WNUR FM, Arthur, Disney, Horror Hosts, Idina Menzel, If/Then, Jammin' with Jamie, Movies/Film, Music, Northwestern University, Radio, Svengoolie, Television/TV, The Muppets, Theatre, Wicked and tagged Travel Tunes on May 28, 2015 by Jamie Lee. “Jammin’ with Jamie” Theme: “Tax Tunes”! So many Jammin’ with Jamie traditions, so little time! And time is money! Which reminds me… to remind you that income taxes are due April 15. This entry was posted in 89.3 WNUR FM, Galavant, Horror Hosts, Jammin' with Jamie, Julie Andrews, Mary Poppins, Movies/Film, Music, Northwestern University, Radio, Svengoolie, Television/TV, The Muppets and tagged Monetary Melodies, Tax Tunes on April 9, 2015 by Jamie Lee. “Jammin’ with Jamie” Theme: “Haunting Horror Host Harmonies! (Halloween 2014: Part 4)”! It turns out I misread WNUR’s schedule, so we actually have one more Halloween-themed jam session to squeeze into the spooky season! On October 10, Rich Koz (a.k.a. 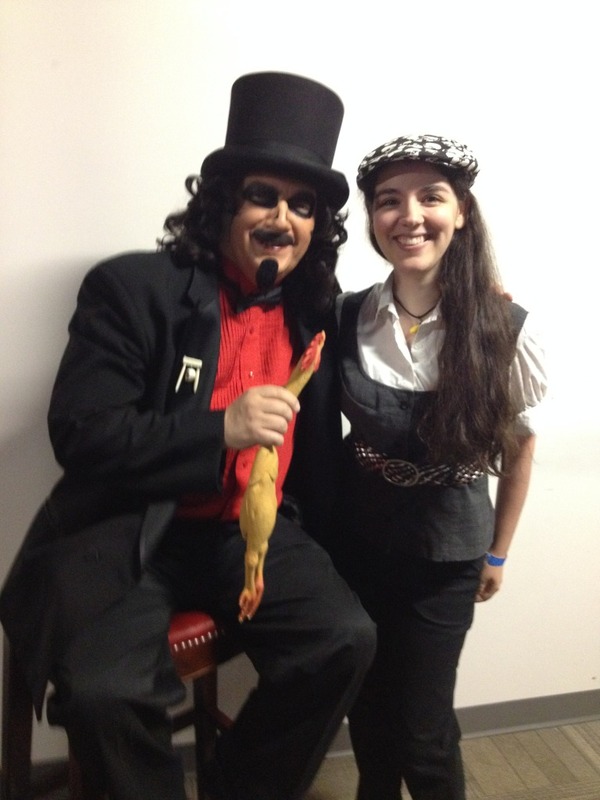 “Svengoolie”) was honored for his thirty-five years as Svengoolie (formerly “Son of Svengoolie”) at the Museum of Broadcast Communications (Museum.tv) in Chicago. It was an amazing event, and I highly encourage all of you to go to the MBC and check out all of the great exhibits they have there––– including, of course, the brand new Svengoolie exhibit that was unveiled that night! The exhibit includes his original coffin that was also used by Jerry G. Bishop, the original Svengoolie. Mr. Goolie himself (and me) at the MBC! It’s always great to see you, Sven! Also, October 31, 2014 has been declared “Svengoolie/Rich Koz” day in both the city of Chicago and the state of Illinois in his honor. Congratulations, Rich Koz! You certainly deserve it! Of course, in case anyone hasn’t heard yet, the Queen of Halloween herself, Elvira, Mistress of the Dark, is hosting a brand new series on Hulu (Hulu.com), entitled, 13 Nights of Elvira, that I also highly recommend! … Do people in “Berrrwyyyn” get this show? This entry was posted in 89.3 WNUR FM, Elvira Mistress of the Dark, Halloween, Horror Hosts, Jammin' with Jamie, Movies/Film, Music, Northwestern University, Radio, Svengoolie, Television/TV, Tim Burton and tagged Halloween 2014, Haunting Horror Host Harmonies, Mr. Lobo, Winnie the Pooh on October 24, 2014 by Jamie Lee. “Jammin’ with Jamie” Theme: “Terror-ific Trick-or-Treat Tunes! (Halloween 2014: Part 3)”! Well, the bad news is, we’re wrapping up our month-long theme of Halloween harmonies to haunt our heads and really get us into the spirit of the spooky season. … The good news is, we have a fearfully fun jam session to wrap it all up as tightly as a mummy! Last week, we jammed to songs about both the supernatural and the sci-fi sides of Halloween. This entry was posted in 89.3 WNUR FM, Elvira Mistress of the Dark, Halloween, Horror Hosts, Jammin' with Jamie, Movies/Film, Music, Northwestern University, Radio, Svengoolie, Television/TV, The Rocky Horror Picture Show, Tim Burton and tagged Halloween 2014, Mr. Lobo, Terror-ific Trick-or-Treat Tunes on October 17, 2014 by Jamie Lee. “Jammin’ with Jamie” Theme: “Supernatural and Sci-Fi Songs! (Halloween 2014: Part 2)”! We’re continuing on with our month-long theme of Halloween harmonies to haunt our heads and really get us into the spirit of the spooky season! Last week, we jammed our way through the roster of the various creatures that tend to lurk around this time of year. But have you ever noticed that the scares that surface at this time each year tend to fall into one of two categories? This entry was posted in 89.3 WNUR FM, Elvira Mistress of the Dark, Halloween, Horror Hosts, Jammin' with Jamie, Movies/Film, Music, Northwestern University, Radio, Svengoolie, Television/TV, The Rocky Horror Picture Show and tagged Halloween 2014, Sci-Fi Songs, Supernatural and Sci-Fi Songs, Supernatural Songs on October 10, 2014 by Jamie Lee.